iPhone is one of the best and finest creation of Apple Inc. Whether you agree or not but it fantasizes everyone and they want to get their hands on it. There are a number of Apps available on the internet but the business is still in its initial stage and a number people want to develop these apps. Talented iPhone Web developers are still demand if the day. So if you also want to be an iPhone Web developer or already are and want to do something new and do not know where to turn for fresh new resources, then you have ended up at the right place by visiting web3mantra.com. Today I have compiled a list of iPhone Web Development Resources….check them out!! This is the go-to book for beginning iPhone developers by Jeff Lamarche and Dave Mark. It takes you from downloading the SDK to creating your very own apps. The official page and support site. This book assumes you know a bit of C/C++, and it’s a really good book for getting started with Apple’s developer frameworks. There isn’t a lot of iPhone-specific stuff in this book, but a lot of what you learn carries over into iPhone development. The iPhone in Action book covers both native and web programming in step-by-step tutorials. It’s a complete primer to iPhone development. Jump into application development for today’s most remarkable mobile communications platform, the Pragmatic way, with iPhone SDK Development. This Pragmatic guide takes you through the tools and APIs, the same ones Apple uses for its applications, that you can use to create your own software for the iPhone and iPod touch. Packed with useful examples, this book will give you both the big-picture concepts and the everyday “gotcha” details that developers need to make the most of the beauty and power of the iPhone OS platform. This is the book to get if you’re just starting out programming. It assumes you have no prior programming knowledge before picking it up. It’s highly recommended for people who don’t know any programming and want to learn Objective-C. Not a lot of iPhone-specific stuff in this one, but a lot of this knowledge will carry over when you do want to create iPhone apps. This book is full of code snippets that will help a lot of people with common tasks that Apple’s iPhone SDK doesn’t provide. There are some code blunders in this book, but luckily they’ve fixed the code and put it up here. They also have movies at this site that demonstrate what each mini-project does. improve an iPhone’s camera (timer, multi-shot, spirit-level, on-screen grid, ‘press anywhere’ capture), meaning you can bin a half-dozen standalone apps that offer similar things. view your contacts’ photostreams, and upload images snapped on the smartphone’s camera – although it lacks the serendipitous “Explore” feature of the full website. The BlackBerry software is limited, focusing solely on uploads. geolocation info and a photo to the recording before you upload it and we’ll save all that with the file. Jeff Lamarche is also the author of Beginning iPhone Development: Exploring the iPhone SDK. He keeps his blog updated constantly with cutting-edge code and even a guide to surviving WWDC. The best iPhone developer blog I’ve seen. It’s written by Dan Grigsby and Ari Braginsky. I recommend you start with the top posts on the right sidebar and go through all the archives. Pretty much all of the articles are gold. Dr. Touch gives us a mix of specific programming solutions as well his experiences with the App Store and his sales. The recipes section of his blog have really useful code snippets to help you build your app. A how-to focused blog run by John Muchow. The posts are put together in nice bite-size pieces. This blog isn’t updated that much these days, but the articles are still useful. It’s 100 percent dedicated to code tutorials. It’s a fusion of iPhone app marketing and coding. Most of the site is focused on marketing your app. Dual-stick” shooters are in no short supply on the App Store, so it’s really saying something when I assert that Age of Zombies is the best one currently available. In the game you’ll play as Barry Steakfries, a foul-mouthed character with a penchant for guns and one liners. The game uses the same virtual joystick controls that many other iOS games rely on, but they work much better in this case than in some other releases. Crisp pixel art, a varied selection of weapons, and great humorous writing make Age of Zombies a shooter no iPhone owner should miss. Games like developer GAMEVIL’s Zenonia showed that you could make a good action-RPG on the iPhone, but Across Age (and it’s high-definition release, Across Age DX) showed that you could also make a great one. The top-down game sees you escorting a young girl with hidden powers through a story that dabbles in time-travel, and the game manages to really explore its time-travel mechanic in a way that makes for some really interesting puzzles. With gorgeous sprite-based graphics, dungeons that’ll make you think you’re playing a Zelda game, and an addictive leveling system, Across Age feels like a freshly discovered Super Nintendo classic. Yo-ho-ho! This be the classic game ye scurvy dogs have been waiting for! A classic point-and-click adventure from way back in 1991, Monkey Island 2: LeChuck’s Revenge has been dusted off, turned into a ‘Special Edition’ (new graphics and audio, hints system, updated controls), and fashioned into a thing o’ beauty. Arrrrrrr! With gameplay that combines a Puzzle Quest like battle system with the classic side-scrolling Castlevania games, Encore of the Night is a strange but surprisingly good App Store release from Konami. Think Bejeweled but with tons of RPG elements, and that famous Castlevania art style. WebOS vendor Morfik has created a platform for developers to build applications for Apple’s iPhone, which is being released Friday night. Morfik claims this is the first development tool for the iPhone. Up till this point, no one had announced a development tool for the iPhone – although there have been suggestions by bloggers that Adobe AIR and Google GWT might become iPhone development platforms. However, it seems Morfik is the first to do it. Registered Apple Developers can access iOS SDK 4 for developing iPad, iPhone and iPod touch apps. 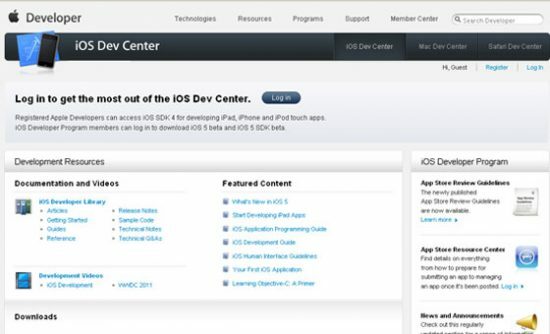 iOS Developer Program members can log in to download iOS 5 beta and iOS 5 SDK beta. It allow you to create an alert with only four touches to help you to schedule your calls. The interface is simple and clean with intuitive like an Apple interface, which I am sure most Mac Fans will love it. “Call Me Later” is powerfully integrated to the original iPhone app “Calendar” (which cannot schedule an alert for a definite contact) and makes you able at first to choose in an easy and quickly way which contact you have to call and then to programme when to do it.